It’s been several hours that a number of protesters have occupied the entrance of the University Central Clinic of Kosovo (UCCK), in order to protect the Drenica Group. IBNA’s news agency correspondent reports that Democratic Party of Kosovo MPs have arrived at UCCK. They are demanding from EULEX to change the court’s ruling according to which all defendants had to be sent at the Detention Facility in Northern Mitrovica. Smajl Elezaj, head of the Organization of the Veterans of Kosovo Liberation Army War, declared that they will not withdraw from their requests until EULEX changes the ruling. Referring to the declarations issues by the family members of the defendants, Elezaj said that the three suspects, Sami Lushtaku, Ismet Haxha and Sahit Jashari, “are not ready to go to the north”. He said that their arrest will not be permitted. This is a paradox situation, because it’s not yet known if the main defendants in this case, Sami Lushtaku, Ismet Haxha and Sahit Jashari have escaped or they’re still inside the premises of UCCK. 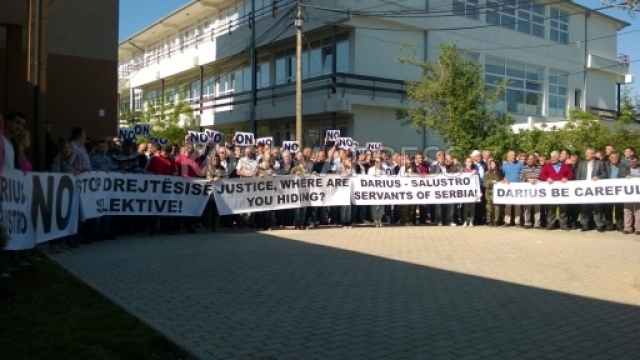 Official reports suggest that they’ve escaped, while family members and protesters say that they’re inside and refusing the court’s ruling to be moved to the detention facility of Northern Mitrovica. This issue has also been commented by the former head of UNMIK’s legal office, who is now an international lawyer in Kosovo, Alexander Borg Olivier. He’s surprised by EULEX’s decision for the transfer of “Drenica Group” in northern Mitrovica, a decision which according to him, violates human rights. “The decision of the EULEX judge is difficult to be justified, it’s surprising and unnecessary. It has spread panic among detainees who don’t want to be transferred in a place where they believe that their life is in danger. I believe that it’s a breach of human rights to transfer someone in a place where one cannot wait the court’s verdict without fearing for one’s life, thus, the decision to send them in this hostile zone”, says Olivier. He adds that if EULEX decides not to execute the court’s order to transfer the detainees in the north of Mitrovica, “this will be a wise move, because the decision is very problematic and unnecessary”. EULEX international mission says that it will not change the court’s ruling to send all the detainees of Drenica Group to the detention center of northern Mitrovica, where today, they were scheduled to appear in the first hearing at the Court of First Instance in Mitrovica. “We’re convinced that the first hearing will take place as scheduled on Thursday at the Court of First Instance in Mitrovica. The scope of the mission is not to allow the escalation of the situation. EULEX will help the authorities of the Correctional Service of Kosovo with extra police forces at the detention center in Mitrovica during the time that the detainees spend there. The rule of law is non-negotiable”, reacts EULEX. Ministry of Justice says that it doesn’t meddle in the work and powers of independent institutions such as prosecution and courts. “Ministry of Justice, as part of the government of Kosovo, has separate powers from the judiciary system and doesn’t intervene in the work of courts or prosecution. On the other hand, Kosovo’s Correctional Service, as the responsible authority for the execution of criminal sanctions, including detentions, is the main institution of State Administration and functions as an agency which depends on the Ministry of Justice”, declares MoJ. The three suspects, Sami Lushtaku, Sahit Jashari and Ismet Haxha are part of what’s known to be as the Drenica Group, comprising of 50 people.